For once I actually have some FOs to show you. I even have two to share, can you believe it? One was knit, the other one sewed. 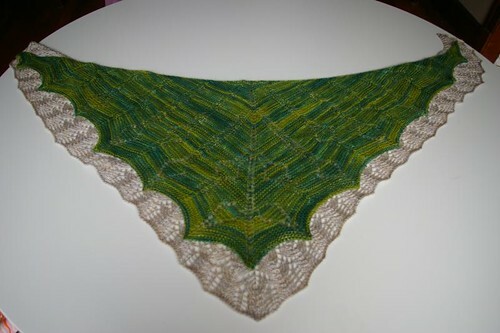 This shawl was knit in the beautiful Handmaiden Mini Maiden, color unknown (one of you just might win enough to knit your own). It took me just under 1 month to finish, or 2 weeks less than how long it took me to knit Ishbel. I love this shawl, very, very much. It was an easy knit (love the garter stitch), the lace was easy to read and the yarn was a pleasure to knit with. I only had to tink back a couple times and the yarn handled it well, even though it had a tendency to stick to itself. Since summer has finally started here in New England, I’ve yet to wear it except for the photo shoot. But I am looking forward to wearing it when it gets cool again! My second FO is the Strips and Bricks quilt I started at the beginning of July. I tried to do one step every weekend and a few weekends later I have a finished quilt. I used a lot of my favorite scraps to make it as well as scraps I received from Linda (check out her new book! ), Carol and Kate. Thank you to all three of you for making this quilt possible! This quilt is going to be given away shortly, I hope the recipient likes it! I might have another FO within a week or so if I can manage to sit down and knit for a bit. My Pomatomus socks less than 2 repeats from the ribbing. I think I just might make it before the end of August! GORGEOUS! both FO’s are soooo pretty! and i’m sure the recipient will adore that quilt! that is one lucky person! How could she not! That quilt is beautiful!!! Both are wonderful! I love the colors in that shawl. Nice! Both of them are beautiful! The quilt makes me happy but then, I’m all about color and lots of it! What wonderful FOs. And I don’t know, but the past two days it’s been awfully chilly in the morning. 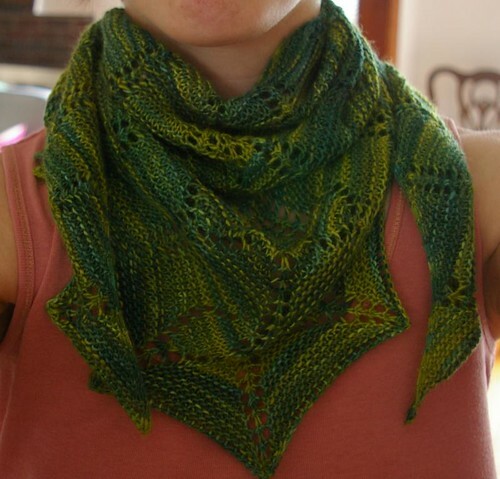 A shawl might be perfect for any early morning outings!! Wow! The shawl is lovely, but the quilt – stunning! These things are both absolutely gorgeous. I’m in awe of anyone who quilts. and you are so fast! 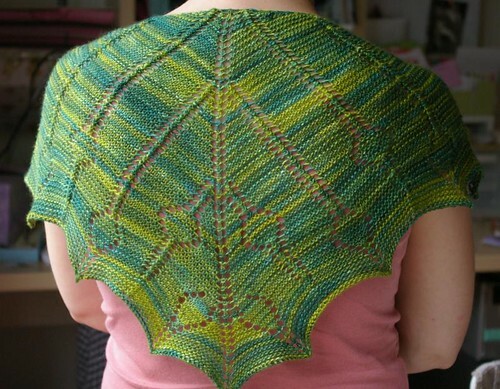 love the green and is it really garter stitch, what an effect, fantastic! I love that Milkweed! What beautiful shades of green and blue. Looks like the perfect size for wearing like a scarf. The quilt looks fabulous, too — nice pops of color against the white. Both FOs are gorgeous!!! 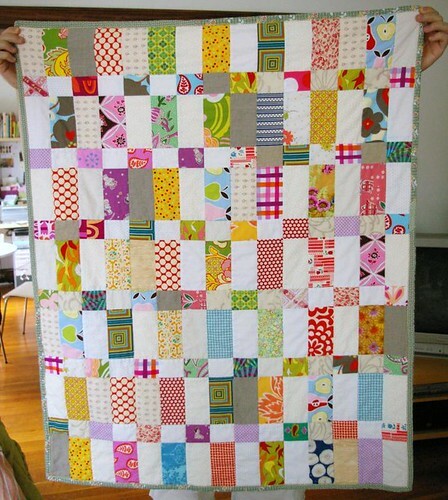 That quilt is just perfect for showing off beautiful scraps! Both are gorgeous, but since I can only relate to knitting right now, I’m going to focus on the Milkweed. The colors are fantastic and it looks perfect! LOVE the quilt!!! You don’t know how many times I’ve pulled it out to look at it since you gave it to me, but it’s just wonderful! I’m honored!!! Thanks so much for making it for us. I’ll let you know how the baby likes it (she’ll love it too, of course)! Hi! Love both the shawl and the quilt. They are fabulous!!!!! !